The city of Hamtramck has long been touted as having more bars per square mile than any other city in the country. If the folks of Hamtramck Bars have their way, we may soon have one on wheels. 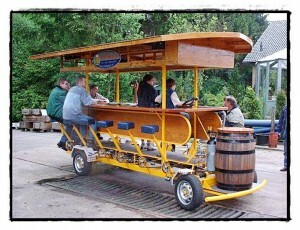 Well, a beer wagon (or “bike”), anyway. Consider the possibilities. Hung over, and need some hair of the dog? Could be just a whistle away! On foot, so you know they can’t get you for a DUI? Grab a brew on the go! Got run over by the thing? At least they can give you some liquid anesthetic while you wait for the doc! Well, they have’em in Amsterdam, and I can personally think of nothing I’d rather see than this town become another Amsterdam. Can a red-light district be too far behind? I pray not. But wait – it only gets better — or perhaps more sordid, depending on your outlook. Because you see, the way they want to finance the project is with… Ta-Dah! Gambling! All kidding aside, it sounds like a great clean, Euro-style good time. Here’s the idea behind Saturday’s (Aug. 13) Hamtramck Bars Poker Run. You show up at the Polish Sea League (2601 Edwin St., corner of Brombach) between 1 p.m. and 2 p.m. to register and pay a $10 donation. You have a drink (teetotalers, dieters, or the very religious may note that the drink need not contain alcohol), and you’ll be given a playing card, stamped in some fashion with the Sea League’s name. From there, it’s on to the next three bars, in any sequence you choose: Whiskey in the Jar (2741 Yemans, just west of Jos. Campau), Skipper’s (9735 Conant at Evaline), and Small’s (10339 Conant at Caniff). Again, for each drink, you’ll be issued a stamped playing card. You are “building your poker hand,” even as you put on a happy face. Not pleased with your first four cards? Stop in at the Two Way Inn (it’s optional – 17897 Mt. Elliott up just south of Nevada), have a drink, and get a different card to replace one of yours that you don’t like. Finally, it’s off to The Painted Lady Lounge (the old Lili’s, 2930 Jacob St., east off Jos. Campau) for your last drink and card. Voila! There’s your poker hand. See if you won some prizes. Kevin LaPointe, one of the founders of Hamtramck Bars, was kind enough to return our phone call. He assures us that the prizes, while nice, are not worth cheating to get. Just go to the “Hamtramck Bars” Facebook page, “Like” them, and they’ll keep you up to date on other happenings. 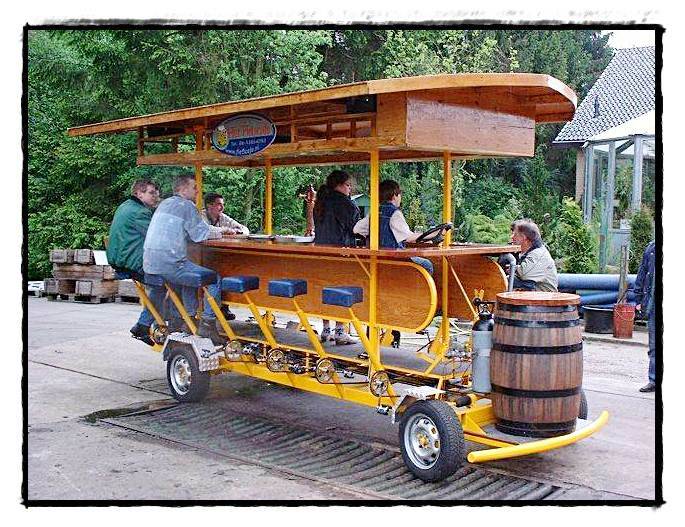 So, what does a beer bike cost? The sticker price may indeed shock you: $20,000. Maybe we’ll be needing that red-light district after all, to raise that kind of money? And will this eventual beer bike be a private business, plying the streets of Hamtramck with the devil’s brew on a regular basis? LaPointe was a little vague on the point, but did suggest that the details will work themselves out. “Groups of friends could rent it, for example,” he said. Images flash through the mind on that one. Still, it would certainly be a terrific conversation item, bringing further uniqueness to a city that already fairly reeks of it. It seems right in line with the town’s European heritage. Beer. And this is Hamtramck.